One must-do loop while in Milan is the one where you go and pay tribute to the patron saint of cycling in Italy. In this day and age of road rage, restricted budgets for cycle safety or staging cycle races, it's good to appreciate the positive things in place for cyclists. 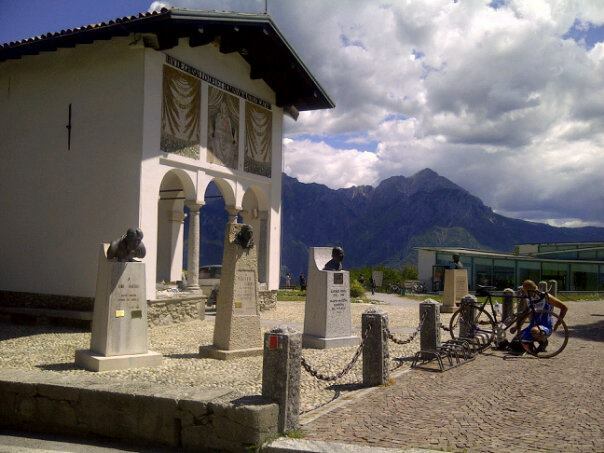 Situated near Como, at the top of a village called Magreglio is the Madonna del Ghisallo - a chapel dedicated to cycling, and a museum. Thousands of keen cyclists come to this place at weekends to either visit the museum or to light a candle and say a prayer. I have found a very pleasant loop from Como to the Ghisallo and back. 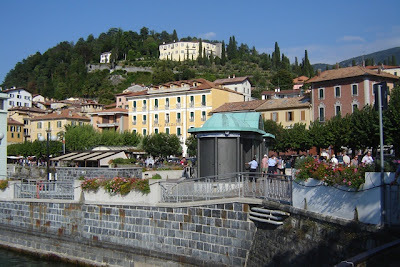 It's very scenic, especially on the road up from Como to Bellagio. Also, if you get the chance to hang out in Bellagio do so. The town is a marvel. 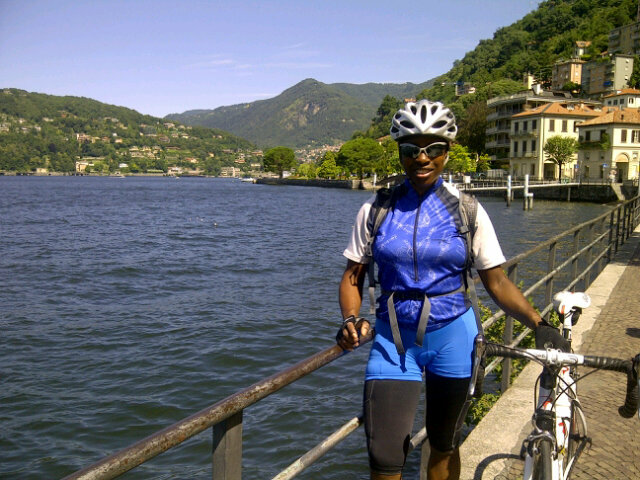 Riding along to Bellagio is easy enough and is a joy, especially as it is the least busy of all the lakeside roads. The road twists around the rocky facades and the lake meanders in different directions, revealing more surprises. There are a couple of tunnels along the way, but they are well lit. 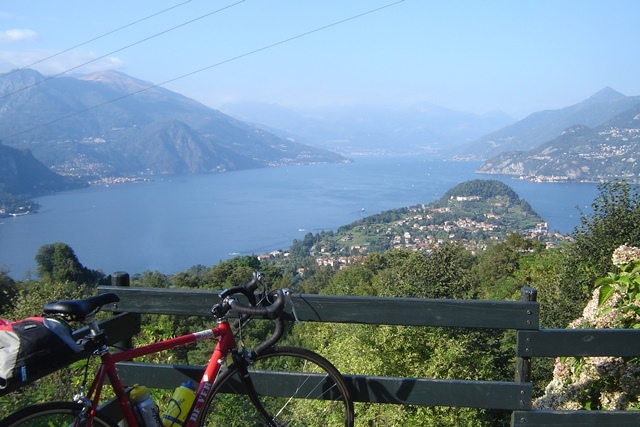 The Madonna del Ghisallo climb is a well-known feature of the Giro di Lombardia professional cycle race - one point where the decisive moves can be made. As with other climbs in iconic cycle races, lots of club riders like to have a go at riding up this climb "at their leisure". It is not a long ascent - around 8km, though the first 4km are the toughest. Some sections of the hairpins are above 15%, and the road twists and turns as you tackle one relentlessly steep hairpin after another. After around 3km there is a wide lay-by with a viewpoint. It makes for a very convenient spot to stop and admire the view of Bellagio and Lake Como down below. It's also a good excuse for a rest! As you look behind you feel quite impressed with yourself at how far up you have climbed. Once you reach this point the worst of the climbing is over, as the gradient becomes a little shallower and there is even a mile or so of descending. After the village of Civenna the road begins to climb again for about a mile and as you reach Magreglio you begin to see cyclists milling around. You then know you've reached the summit. This place definitely merits a stopover. The chapel is like a mini museum, with various exhibits - bicycles from past and present professional cyclists, plus other memorabilia including cycle jerseys. The bicycle that Fabio Casartelli rode at the time of his fatal crash in the 1995 Tour de France is even on display. 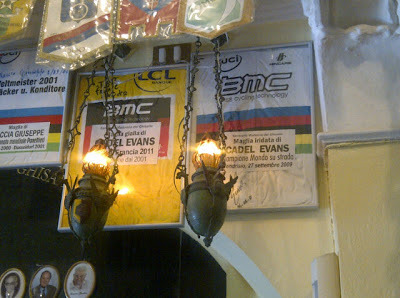 Also Cadel Evans donated his World Champion's Jersey and his 2011 Tour de France yellow jersey to the chapel too. Inside, lots of people light candles and make a charity donations. And for a bit of divine inspiration there is also a little prayer for the welfare of cyclists (in Italian) that you can say before hitting the road. If you haven't seen enough cycling exhibits there is an actual museum within the grounds, just 20m down from the chapel. For those who aren't bothered about cycling memorabilia there are stalls selling sweets, and some great areas for more photo snaps of Lake Como and the surrounding area. The first time I rode up this climb I found myself among a group of cyclists who were taking part in a cyclosportive - the Gran Fondo Fabio Casartelli. I ended up playing cat and mouse with a few of the competitors. It made me feel good that I managed to do the climb quicker than some of the guys around me - I didn't even need to stop, unlike a few of them. The thing is, I was climbing this at the same time as the stragglers in the race, and I don't think any of them were under 55 years old! Also they had probably already ridden around 100km prior to reaching this point where I only had about 20km in my legs! I got a clap and a few cheers of "complimenti" from the spectators, which made me feel even more of a fraud! Completing the loop back to Como is not difficult. The Ghisallo climb is the hardest part, so afterwards it's a case of sitting back and relaxing while you enjoy lots of descending. The best part is the section down to Canzo. You then head towards Ponte Lambro and Erba where you have a bit of false flat and a mini climb. After that it is a flat ride through various small villages (Albavilla, Albese, Tavernerio, Solzago) after which you enjoy a final whooshing descent into the centre of Como. When I finish this 70km-loop I always arrive back into the town feeling all exhilarated at having done a very pleasant ride and appreciated one of the most beautiful views around. More details of the route are here. For those wanting to try something slightly more challenging, instead of descending all the way down to Asso/Canzo from Ghisallo, take a sharp right hand turn to Sormano. This road climbs gradually up many switchbacks to reach the village, where you have the option to attempt the infamous Muro di Sormano (2km at an average of 15% gradient). After Sormano the route goes through a high glacial valley known as the Pian del Tivano - big tourist spot for walking, cross-country skiing, caving, or popping into an agroturismo. The road then descends dramatically to Nesso where you rejoin the original outbound lakeside road back to Como. This is definitely a route to go for if you are in the Como/Milan area. There is even a local company that hires out nice road bikes if you don't have your own. So there's no excuse not to ride it! Wanna do the Prix des Rousses? What is the Cost of a Cyclist's Life? £2,700? Is the grass greener in Milan? Mo' facebook friends Mo' problems!